Paytm has today announced launch of a unique mobile marketplace app that allows users to bargain for a deal before they buy. Yeah, exactly how you do it in the offline world. 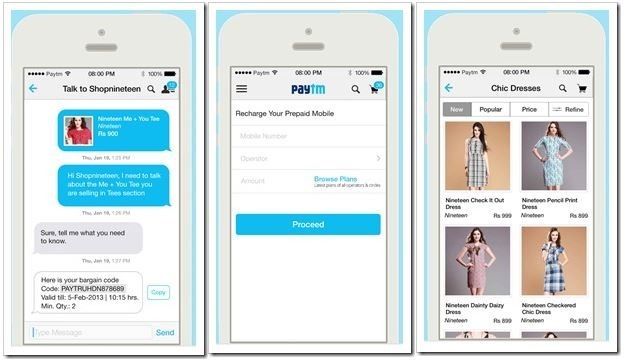 While many shopping apps available currently on Android and iOS app stores, Paytm hopes to fundamentally change the way how buyers purchase a product on their smartphones. The app has already been launched on Apple app store and will go live on Google Play store from next week. All 6 million existing Paytm mobile app users will get access by end of February. The app already features range of lifestyle and home furnishing categories along with their existing mobile and DTH recharges. The App currently has more than 100,000 products from 250 merchants across India. Although, we could not use the app ourselves as of now, what the app is essentially trying to do is mimic the offline “over the counter” purchasing workflow into the mobile world. We all, especially Indians, love bargains and do not leave a single opportunity where we can show our flair for it. 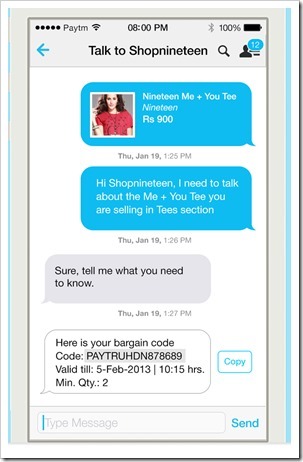 With Paytm app, users can now bargain for their purchases even on their mobiles! Along with this unique feature, the app now also comes with new Paytm Cash Wallet feature for purchases. It is is a mobile prepaid payment option by which users can add cash from their bank / credit card and shop much faster on the mobile phone. Users can get cash back or refund from a merchant in Paytm Cash Wallet and use it across every item sold in the marketplace. This feature has been incorporated after a RBI license granted to Paytm. On their existing app, Paytm already has over 1 million saved credit cards. We will try out the app when it is available on Google Play Store next week and update this post with actual review of this app!